Professionals have to fulfill requirements for continuing education in order to maintain licensing. ECG Academy can provide approved CE contact hours to Registered Nurses. ECG Academy is an approved CE provider accredited by the California Board of Registered Nursing. Please check with your individual state licensing board to make sure that they accept courses approved by CBRN. Most nurses who work on cardiac telemetry units are exposed to monitoring and rhythm strips. Critical care patients are continuously monitored and their rhythm can change at a moment's notice. Unfortunately, cardiac arrhythmia training is lacking in most nursing schools, and hospital inservice programs barely scratch the surface of deciphering the arrhythmias seen every day on these units. Now you can become a resource at your hospital and not rely on telemetry techs or your intuition. 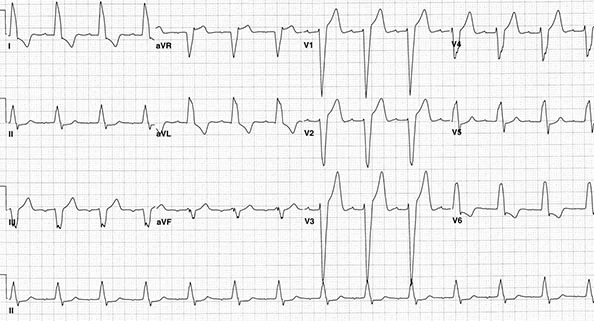 ECG Academy provides you with the tools to correctly identify the arrhythmia even when most others get it wrong. You can earn CE contact hours and become an ECG Expert on your unit with the Certificate Courses at ECG Academy! By incorporating ECG Academy's unique video tutorials into an educational framework, we are now able to track each participant's progress. The Sections in the Level 1 (Advanced Rhythm Strip Analysis) and Level 2 (12-lead Interpretation) courses each have 3-5 videos, each 5-15 minutes long, that cover a particular topic. At the end of each section there is a short quiz to reinforce the information and to measure your proficiency. There is a newly-added section with a collection of "Essential ChalkTalks" at the end of each level, to help you practice analyzing unknown tracings. At the end of the each Level there is a final exam. Completion of the program qualifies the participant to receive a "Certificate of Completion." that is worth up to 22 CE Contact Hours for RNs. You'll also receive access to ECG Academy's weekly ChalkTalks, which are invaluable to help you tackle more difficult tracings. To purchase the course, click Subscribe Now below and choose one of the Certificate Courses (Level 1 or Level 1+2). Please note: It generally takes up to 24 hours to get you enrolled after you purchase the course. "I do see that you use a different approach, and in all my almost 9 years in critical care, this is the most comprehensive course I have ever taken. It is truly making me think what is going on with the heart and how the current is flowing. :) I wish I had your course earlier." "It was always complicated and difficult for me to understand ECGs but with the help of such a talented and professional teacher, I am able to comprehend everything about them now. Thank you very much Dr. Nick for your great help!!! Looking forward to watching more new videos!! "